Nicaraguan anti-government student protesters during a visit to Ruben Dario Park in Sweetwater last year. 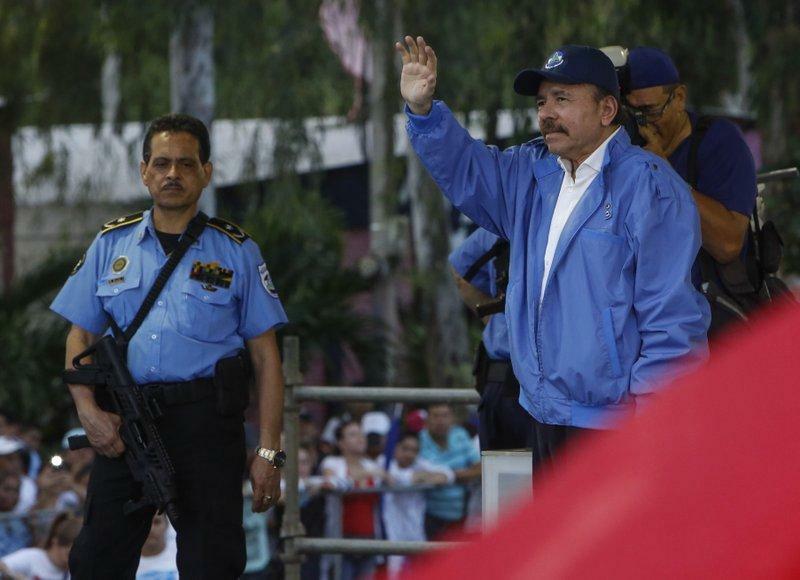 Back in April, Nicaragua erupted in protests calling for the ouster of President Daniel Ortega – who’s ruled the poor Central American country for 24 of the past 40 years and is widely accused of turning it into a corrupt dictatorship. His security forces responded with a brutality Dr. Josmar Briones had never seen. Briones was a neurosurgeon in Managua when the protests began. Speaking over lunch at a restaurant here in Doral, he says officials in the regime handed down an unwritten order to hospitals and clinics: Do not attend to wounded protesters; hand them over to police. So Briones and his wife Ethling, who is also a doctor, defied the order. Soon came the harassment from Ortega’s regime and his leftist Sandinista party. Briones received a protester at his clinic who’d been held in Managua’s now infamous Chipote prison. He says the man had been sexually assaulted with a military rifle. After regime officials found out he’d treated the man, Briones came home one day to find agents had poisoned and killed his family dog. Briones then discovered he was on the regime’s list of “wanted terrorists” – Ortega and his wife, Vice President Rosario Murillo, insist the protests are part of a violent, foreign-led “coup” against him – and the doctor and his wife and two young kids boarded the next flight to Miami. "You have two choices if you're a dissident today in Nicaragua," says Briones. "Exilio o plomo." Exile or a bullet. They recently moved to another state because they fear Ortega agents are watching them even here – and we spoke during one of their visits to Miami as they checked on the status of their asylum application. Dr. Josmar Briones (right) and his wife Dr. Ethling Briones during a recent visit to Miami. Thousands of other Nicaraguans in similar straits have come to South Florida since last summer, an exodus often overlooked amid the emergency across the Caribbean in Venezuela. And many more are expected as it becomes clearer that Nicaragu’s crisis – and the Ortega regime’s crackdown – could last much longer than expected, if not indefinitely. “My friends in the community are constantly asking about attorneys for immigration cases,” says Francisco Larios, a Nicaraguan-American and economics professor at Miami-Dade College who also runs a networking website for Nicaraguan exiles called Ciudadano Equis, or Citizen X.
Larios came to Miami 39 years ago as a teenager after he was briefly jailed by Ortega’s first regime, the Sandinista Revolution – which Larios initially supported because it had brought down brutal right-wing Nicaraguan dictator Anastasio Somoza. (Ortega's regime is now often compared to Somoza's). He thinks Nicaraguan exiles 2.0 have even more urgent reason to escape here. They know that all too well in the house of Pedro Espinoza, which has become a refuge for Nicaraguan exiles. Espinoza left Nicaragua in 1990 for Miami, where he owns a landscaping business in Kendall. His father was a contra rebel who fought the Sandinistas in the 1980s. Which is why, when Espinoza heard Nicaraguan protesters from his rural home province of Chontales needed refuge, he took two of them into his home last month. One is Alfredo Mairena, brother of Nicaraguan land reform leader and anti-regime protester Medardo Mairena, who was jailed in July for the murders of police officers in a rural province – even though he was in Managua when they were killed. A Sandinista judge convicted him anyway – and Monday night he was sentenced to 216 years in prison. Nicaraguan-American Pedro Espinoza (left) watching news of Nicaragua on Spanish-language TV at his home in Kendall with Nicaraguan exiles Marcos Pineda (center) and Alfredo Mairena. Avoiding the regime’s prisons was also the reason an engineering student named Orlando eventually arrived here two months ago – escaping arrest after he’d try to help a mortally wounded fellow protester during an event last May that Nicaraguans now call the Mother’s Day massacre. “As we marched in Managua that day we realized a sniper with a Dragunov rifle was just above us on top of the baseball stadium,” says Orlando (who asked WLRN not to use his last name, to protect family in Nicaragua.) He says the sniper then shot demonstrator Francisco Reyes in the head. “I didn’t know how to help him,” Orlando recalls. He and another protester put Reyes on a motorcycle and whisked him to a hospital, where he died. He was one of at least 16 protesters killed that day. “Plomo al golpista!” he says, meaning “Kill the coup monger!” Orlando snuck out of Nicaragua last summer to Costa Rica – where tens of thousands of Nicaraguans have taken refuge – and made his way to Miami, where he too is seeking asylum. 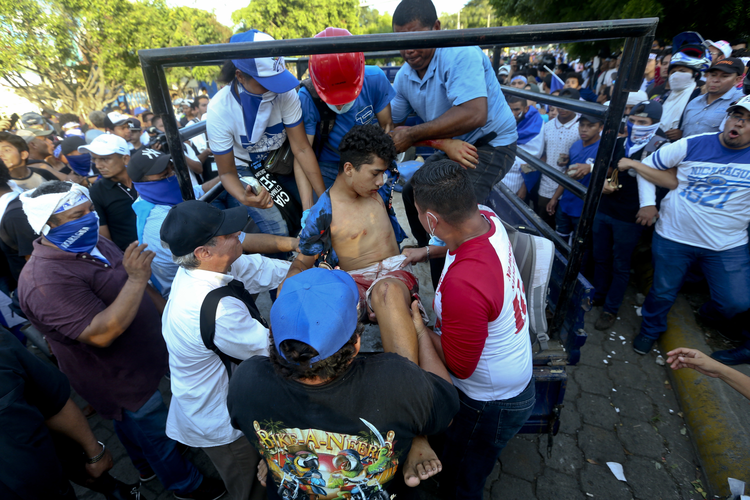 A student protester with a bullet wound is helped into a pickup truck in Managua last May during the Mother's Day massacre. But rights groups worry the Trump Administration is instead detaining and deporting Nicaraguan exiles – and Nicaraguan media report many who are sent back are hauled to prison as soon as they arrive there. “We are concerned about the [U.S. immigration] judges,” says Manuel Abaunza, a director at the Miami office of the Permanent Human Rights Commission (CPDH), a Nicaraguan NGO. President Trump also wants to end Temporary Protected Status, or TPS, for Nicaraguans. Miami politicos like Congresswoman Debbie Mucarsel-Powell are pushing legislation to extend it. All that matters a lot to exiles like Aradia Salgado. She worked for Nicaragua’s Supreme Court but joined the anti-Ortega protests – and fled here last year after police moved to arrest her for terrorism. But Salgado had to leave her two young sons with her father because they didn’t have visas to enter the U.S. Working as a waitress in Lake Worth, she hopes for asylum so she can bring them here, sinces he’s certain if she’s deported she’ll go to prison in Nicaragua. Nicaraguan exile and TV reporter Migueliuth Sandoval, whose journalist husband was killed during ant-government protests last year, at the Miami office of the Permanent Commission on Human Rights. The regime has since convicted two young men for Gahona’s killing. But rights groups insist they were falsey accused – and that videos prove police were the only armed people in the area where Gahona was shot. That argument was strong enough to convince a judge here to grant Sandoval asylum just before Christmas. She now works in Miami with the CPDH helping other exiles with asylum applications. If regime forces did kill Gahona, it was an omen of the onslaught on Nicaraguan media that was to come. Since April, scores of independent journalists have been forced out of Nicaragua (some have been jailed in Nicaragua), including Wilfredo Miranda of the newsweekly Confidencial. His investigative reports found Ortega security forces had shot and killed arrested protesters execution-style. After arriving in Miami last month, during an interview with WLRN, Miranda got word on his Smartphone that his work had won the Rey de España prize from Spain – one of world’s most prestigious journalism awards. "This at least helps put the Ortega regime’s human rights abuses back on the radar,” Miranda says. And, he adds, it helps make exile feel more like a show of strength than a sign of surrender. 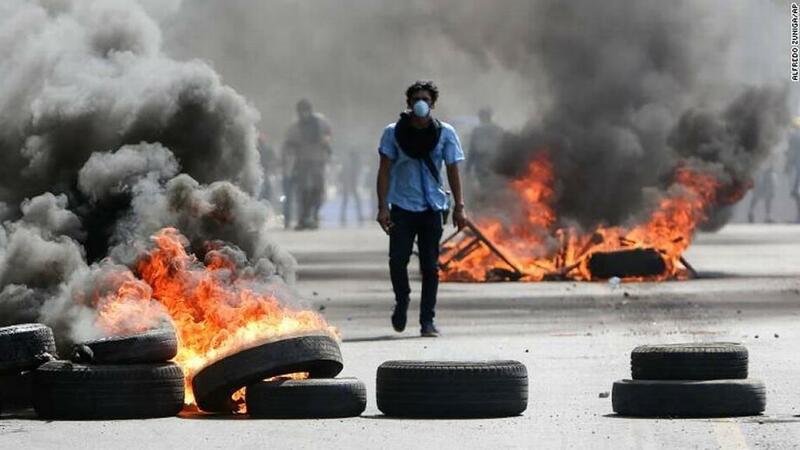 A Nicaraguan anti-government protester walks amid burning tire barricades in Managua last year.